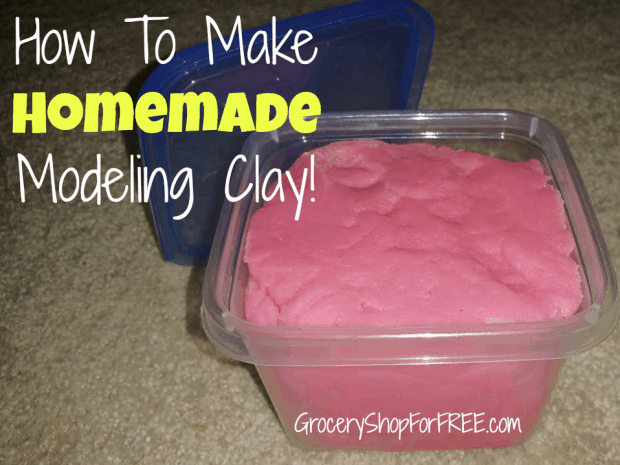 How To Make Homemade Modeling Clay! You are here: Home / DIY / How To Make Homemade Modeling Clay! I have never made clay or play dough, so this was fun for me, too! Combine water, salt, cream of tartar, and food coloring. Put it all in a your saucepan and stir until well mixed. Cook the mixture constantly over medium-low heat until the mixture is hot. Then, add in the vegetable oil, continue stirring. Begin adding flour slowly. Add one cup at a time and stirring well as you go. It will begin getting thicker and harder to mix, continue mixing. After you have added all of the dough and it begins to get stiff and come away from the sides of the pan, turn it off and turn it out on wax paper to cool. Once it’s cool enough you can start kneading it until it’s smooth. Store in airtight container, it can be kept for months. Yields 4 cups of clay. Make sure to stop back by and tell us what you made with your Homemade Modeling Clay!